How were the ornamentations made and used? The technique for keeping plants as dried reference specimens began in Tuscany in the 16th Century. Luca Ghini (1500-1566)introduced this method to his students at the University of Bologne. However, the preparation of herbarium specimens in this way had much earlier origins. The oldest example is probably a specimen from an olive tree (Olea europea) derived from an Egyptian pyramid dating back to the time of Ptolomy (from 305BC), see picture on the left hand. This specimen is currently housed in the herbarium at the Royal Botanic Gardens, Kew. To see this specimen larger, click here. Initially herbaria were bound together to form books, such as either that of Rauwwolf housed in the Leiden branch of the National Herbarium, or that of Petrus Cadé, the oldest Herbarium in the Dutch speaking region currently housed in the Utrecht branch of the National Herbarium of the Netherlands. In the 18th Century botanists started to keep the individual herbarium sheets separate which allowed systematic ordering rearrangement according to developing systematic ideas. Thus it became possible to lend individual herbarium sheets and exchange duplicates. Because of this it was no longer immediately clear who the owner of a particular specimen actually was. This is perhaps the reason why ornamentations were printed onto the sheets and thus acted as an ‘ex-libris’ for the owner. The same owner also used different variations of ornamentation. It thus became a sort of 18th Century ‘revamp’ of the more traditional system. Adriaan van Royen (uncle) (1704-1779) – botanist at the Botanic Garden Leiden. Unique urns with the monogram AVR. David van Royen (nephew) - botanist at the Botanic Garden Leiden. He used unique urns with his monogram DVR. Maarten Houttuyn (1720-1798) – medical doctor, publisher of natural history and private collector from Amsterdam. Gronovius, Jan Frederik, there are specimens with Gronovius’s handwriting (mainly in the British Museum). There are also flowerpots with the monograph J.F.G. The different ornamentations – pots, medallions, pennants, cartouches, labels – were printed on sheets. The copper plates did not last long and only a few hundred sheets could be made from each etching. Nonetheless thousands of sheets, etchings and engravings must have been produced. Unfortunately only a few uncut sheets have survived. The few intact sheets still provide much information. Leiden owns a few complete sheets belonging to Adriaan Van Royen and it is because of these sheets that we know the names of both the designer, Hieronymus van de My (1687-1761), and the engraver, Johannes van der Speyk (1696-1763). 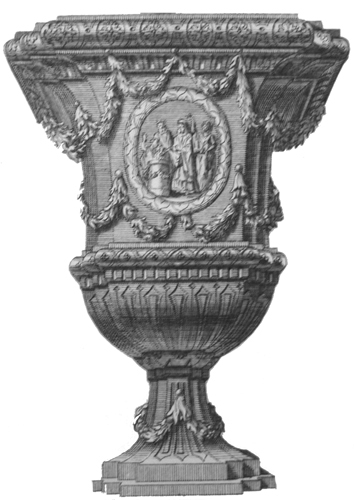 One of vases (shown here), only known from the Clifford collection, was made by Jacobus Schijnvoet in the style of Daniël Marot (1661-1752). This vase is not found in the collections housed at Wageningen but only on sheets held at the Natural History Museum in London. An original etching of this vase is found in the Prof. Lunsingh Scheurleer collection, at the Boymans van Beuningen museum in Rotterdam. 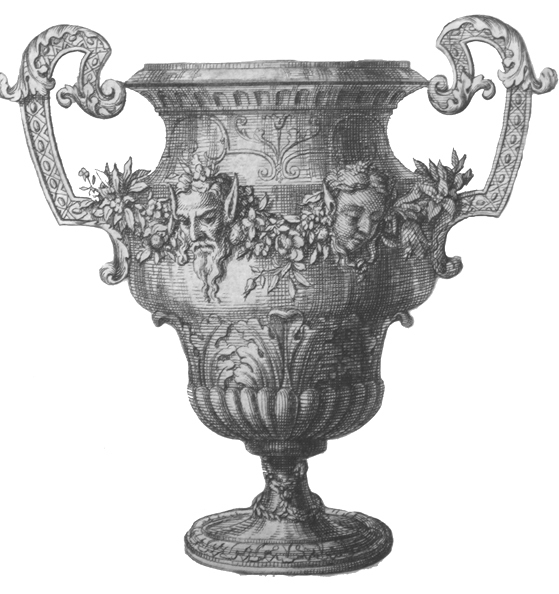 Also the urn with two fiendish heads, present in the collections in Wageningen, is only known from the Clifford collection.